After some unfortunate casting decisions and staging in last fall’s Fidelio, Utah Opera is back on track with Rigoletto. Giuseppe Verdi’s perennial favorite, which opened Saturday night, boasts a solid cast of singers that helps bring a freshness to this well worn staple of the repertoire. Leading off is baritone Guido Lebron in the title role. He brings depth and dimension to Rigoletto and shows there is a lot more behind the jester than one first suspects. Tragically torn between his duty to humor the Duke of Mantua and his court and his increasing disgust at what goes on there, Lebron brings an infinite sadness to the role that is touching and very human. With solid singing and fine acting, Lebron is utterly convincing as Rigoletto. Local favorite Celena Shafer sings Gilda. This is the first serious character for the soprano at Utah Opera, where she has always been cast in comic roles. She hasn’t been typecast like this elsewhere, so this has been long overdue here. And at Saturday’s opening night performance, Shafer showed that she is more than capable in this kind of role. 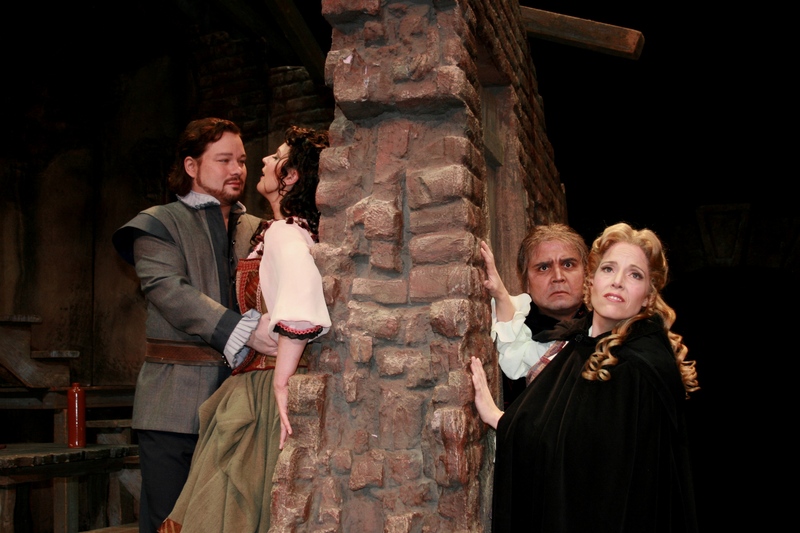 Shafer’s singing and acting brought perspective to the role of Rigoletto’s young daughter. Her Caro nome was certainly a highpoint of the evening. She brought out the joy of a young woman who obviously is in love for the first time. Robert McPherson as the Duke is also a big plus for this production. This is a high tenor role which McPherson handled fabulously. He also brought depth to his character and, in his tender love duet with Gilda in Act I, showed that he can be more than just a shallow womanizer. He showed true affection and love for Gilda in his singing. Unfortunately, McPherson had a bit of a problem with his voice in Act II. His voice cracked a couple of times and he was unable to reach the concluding high D in Possente amor mi chiama, opting to sing it an octave lower. Fortunately that was only a temporary problem, as he was in fine form in Act III and sang a solid La donna è mobile. The supporting cast was also wonderful, especially bass Eric Jordan as the assassin Sparafucile, baritone John Buffett as Cavaliere Marullo and mezzo-soprano Kirsten Gunlogson as Maddalena. The men of the Utah Opera Chorus sang their part with their usual passion and flair for acting. The members of the Utah Symphony in the pit played solidly, although conductor Robert Tweten sometimes let the balance between the orchestra and the singers get out of hand – to the detriment of the singers, of course. And stage director Tara Faircloth allowed the action to flow naturally. This is a production that is worth seeing, no matter how many times one has seen it in the past. Coming back again after I double checked with some research of my own and yes I was right. The D that Robert McPherson sang – not the high one – is indeed the one written in the score. It’s a pity that your review phrases things like he truly missed something by opting out of that note. The last two times I have seen Rigoletto – not in Utah – neither tenor sang the high option, opting for what Verdi had written instead. I saw that performance last night and loved it. However, you might want to grab a score. Your comment about the Duke and the “concluding high D” makes it sound like he missed a written note. The high D in the score is optional, as I recall, and not a requirement by Verdi. As written, the highest note in the role is a B natural.